Austria’s Social democratic Chancellor Werner Faymann felt the need to celebrate on Dec 2, 2009 at the imperial Hofburg. 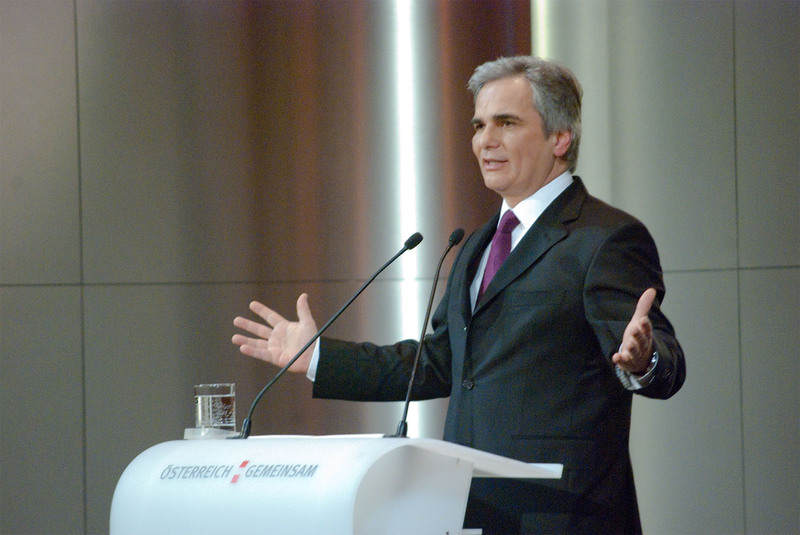 Österreich.Gemeinsam (Austria Together) was the title of Faymann’s speech, the occasion was the first anniversary of the current Austrian government, led by Faymann since December 2008 at the time of economic crisis. The message was simple: all is well at home. Faymann’s skill as public speaker was impressive, evidently inspired by U.S. President Barack Obama in its delivery. But Faymann’s speech – unlike those of the current U.S. President – had only one fault: Staging a political show that demonstrates the art of talking a lot but saying very little. All’s Well That Ends Well is one of William Shakespeare characteristic plays, first published in 1623; its title refers to a proverb whatever the troubles, as long as the outcome is a good one. It seems that the Austrian Social democrats have adapted the theme of Shakespeare’s comedy, signalling that the international economic and financial crises are well in hand. Business as usual, made in Austria. The plenary chamber of the Austrian parliament was packed by 9:00 on Apr. 21, just like the stands for the general public in anticipation of ÖVP Finance Minister Josef Pröll’s 63-minute presentation of the budget. At 9:05, Pröll rose from his seat to deliver what was expected to be his most important speech of his career so far, presenting the budgets for 2009 and 2010, which was broadcast live by ORF Austrian Television. Austria, along with much of the world, is in the worst economic crisis in recent memory and the financial outlook is gloomy. The country’s national debt will increase by 3.5% in 2009 and 4.7% in 2010, well above the permitted Maastricht level of 3%. Consequently, the total national debt will reach an alarming 78.5% of Austria’s GDP by 2013, up from 62.5% in 2008. The bank rescue package (Vienna Review reported, April 2009) weighs with EUR 9.3 billion heavily (2009). The North Atlantic Treaty Organization (NATO), found cause to celebrate this year: On Apr. 4, 1949, the collective defense alliance was founded in Brussels on the eve of the Cold War. Sixty years later and now with 28 member states – Croatia and Albania were formally accepted this year – the organization set out to redefine its role after the collapse of communism 20 years ago. For the first time, the annual NATO Summit was jointly hosted by two member states, France and Germany, whose “close partnership during the course of NATO’s history symbolizes a vision of a Europe whole and free,” according to the NATO website. Following the Summit, member countries’ leaders called for a new doctrine, as the previous one of 1999 neither reflects the changes in Russia nor takes global terrorism – like the 9/11 – into account. “Our strategy cannot remain stuck in the past,” he urged at a talk at France’s Strategic Research Foundation in mid-March, “when the conditions of our security have changed radically.” France, Sarkozy argued, will have more influence in NATO missions while the independence of the nuclear-equipped French military will remain untouched. “Absolutely absurd,“ stated Josef Pröll, Austria’s Finance Minister of the conservative ÖVP on Apr. 15 when confronted with the controversial remark by 2008 Nobel Prize Laureate and Princeton University economics professor Paul Krugman with regards to the possibility of Austria’s bankruptcy. Krugman’s provocative statement with regards to the impact of the financial crisis on Central and Eastern European countries (CEE) at the Foreign Press Club in New York on Apr. 13 sparked high-profile responses and anger in Austria. When responding to the question of high exposure of Eastern European debt by Austrian banks, and whether that might lead the country into bankruptcy, Krugman responded directly. And the New York Times columnist delights himself in his blog two days later of having created a stir by just stating the obvious. Evidently, Krugman’s comment has revived a debate of the past month when media reports, such as by the Austrian daily Die Presse (‘When, exactly, will Austria go into bankruptcy?’), circulated, sparked by concerns of high account deficits in the CEE countries. Austria’s banks (not including Bank Austria and Hypo Alpe Adria as foreign-owned), Pröll clarified, have lending exposures in the CEE area of about EUR 200bn – approx. 70% of Austria’s GDP – but they are apposed to savings deposited of 85% of that amount. The Finance Minister also dismissed the scenario of a complete deficiency of lending, but rather estimates that 10% might have to be bailed-out. The latter seems inevitable, as the European Bank for Reconstruction and Development (EBRD) estimated already in February 2009, that bad debts are likely to exceed 10% of lending in the CEE countries. Indeed, the severe financial troubles of Austria’s neighbours highlights the huge investment Austria’s banks did since the 1990s in the CEE countries. They are the exposed of all financial institutions invested in the area, led by Raiffeisen with 54% of its risk-weighted assets, and Erste Bank Group (38%). Evidently Josef Pröll set off for a ‘face-list’ trip to Bulgaria, Romania, Croatia and the Ukraine in mid-February promoting the Austrian government’s proposal for a financial stability pact for the CEE countries. However, Pröll’s good-will tour sparked fresh concerns for the Austrian financial sector. The Romanian online business magazine Wall-Street consequently titled on Feb. 17 ‘Romania can drive Austria to meltdown.‘ At the same time, Austria’s daily Der Standard estimated that 10% failure of CEE lending would lead to crash of the Austrian financial sector. Not surprisingly, the rescue plan failed to convince the other EU members, as it seemed motivated by Austria’s self-interest only. Krugman’s pointed comment therefore, might be exaggerated as Austria’s bankruptcy seems unlikely at this stage, but has a valuable point: The European governments should not dismiss nor underestimate the effect a widespread financial collapse of financial institutions inevitably has when the CEE countries are not stabilized. Austria would then certainly play the leading role. “Our job is to fix the problem in the financial sector at the least risk to the taxpayer,” U.S. Treasury Secretary Timothy Geithner stated the objective on Mar. 23. Supported by President Barack Obama, Geithner unveiled yet another bailout plan for the struggling U.S. financial system. Those assets cause “uncertainty around the balance sheets of these financial institutions, compromising their ability to raise capital and their willingness to increase lending,” so the Fact Sheet of the Public-Private-Investment Program of the U.S. Treasury, which confirms what has been rumored in early March. Geithner admitted that this plan fuels public anger as Wall Street seems to benefit at times where average Americans suffer. The financial sector has indeed been a major recipient to previous support: As an example, the Troubled Assets Relief Program (TARP) worth more than U.S. $ 700 billion, included $ 25 billion packages each for Citigroup, J.P. Morgan Chase and Well Fargo, the largest amounts ever given to any bank, among others.